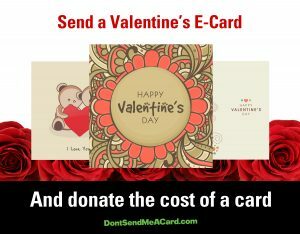 With Valentine’s Day around the corner, why not send you loved ones a Valentine’s Day e-card from dontsendmeacard.com. It couldn’t be simpler. Choose a card from the selection, write your personalised message and send your donation to Living Water Africa. Every penny we receive from Dontsendmeacard will go towards our projects and will help save lives!